Now that Thanksgiving has come and gone it is time to think about the fast approaching Christmas season. We are happy to offer many different gift ideas for all your friends, family and coworkers. Spread cheer with one of our Holiday Fruit Baskets, each offering an assortment of fresh fruit, gourmet food items and even fine wine. Check out our collection and pick the one that’s right for you! Call (978)683-0361 to place your order! Celebrate the holidays with an amazing dinner but end your meal with the very best and most delicious Mann Made Cream Pie! Visit our Homemade Pies page for this years selection of Creams Pies for the holidays. Call our bakery today (978) 683-0361 and order a cream pie for Christmas and all your holiday parties. What do you give the person that has it all?? 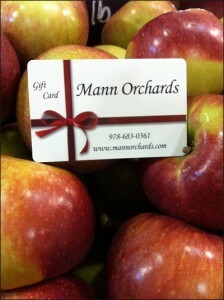 Well, just in time for the gift giving season Mann Orchard Gift Cards are now available online!! Choose your amount and send a gift card to anyone you wish to share locally grown produce, fresh picked apples and homemade baked goods with! Now it doesn’t matter how far you’ve roamed, gifting a taste of the Merrimack Valley is just a click away. It doesn’t end there! Check out store often for a variety of gifts that would be perfect for anyone on your list!